WASHINGTON (CN) — Early Thursday morning Senate Republicans took the first step toward their eight-year dream of rolling back the federal health care law, approving a budget resolution instructing committees to start crafting a repeal bill by the end of the month. After a seven-hour whirlwind voting session that began Wednesday night and ended Thursday morning, the Senate passed the budget resolution by 51-48 vote, mostly along party lines. Kentucky Republican Sen. Rand Paul has criticized his party’s choice to repeal the Patient Protection and Affordable Care Act through a budget resolution without a replacement program, leading him to join Democrats in opposing the resolution. Though the Senate considered 19 amendments to the budget resolution, the budget resolution approved after 1 a.m. Thursday was the one introduced Wednesday afternoon. It instructs Senate committees to put together bills to repeal key provisions of the Affordable Care Act, commonly known as Obamacare, and sets Jan. 27 as the deadline for repeal packages. Senate Republicans now can follow through on their plan to use budget reconciliation to repeal Obamacare, a key point because budget reconciliation measures cannot be filibustered. With a razor-thin majority in the Senate, Republicans would almost certainly be unable to repeal the law without this method, as normal procedures require 60 votes to move forward. As the final votes were counted early Thursday morning, Democrats proclaimed from their seats in the Senate chamber their reasons for voting against the resolution. The dramatic display of protest is unusual, but gave Democrats a chance to criticize Republicans for moving so quickly on repeal. “Because there is no replace, I vote no,” Sen. Claire McCaskill, D-Mo., said on the Senate floor as the marathon vote concluded. The proclamations were technically against Senate rules, leading Sen. Cory Gardner, who presided over the vote, to remind repeatedly his colleagues that debate is not allowed during a vote. Many of the proposed changes to the resolution were symbolic attempts from Democrats to preserve key portions of the Affordable Care Act, or least trap their colleagues in votes that could look bad for them. One such amendment, offered by Sen. Kirsten Gillibrand, D-N.Y., would have prevented the Senate from considering legislation that would “make women sick again,” a play on President-elect Donald Trump’s campaign slogan. Gillibrand elucidated her slogan as legislation that would reduce access to health services that help women, such as contraception or maternity care. “If you love women and if you love your mothers and daughters and wives, please do not unwind the Affordable Care Act,” Gillibrand said on the floor before the Senate rejected her amendment on procedural grounds. Sen. Tammy Baldwin, D-Wis., introduced an amendment that would have prevented the Senate from considering legislation that would reduce the number of young people with access to health care. 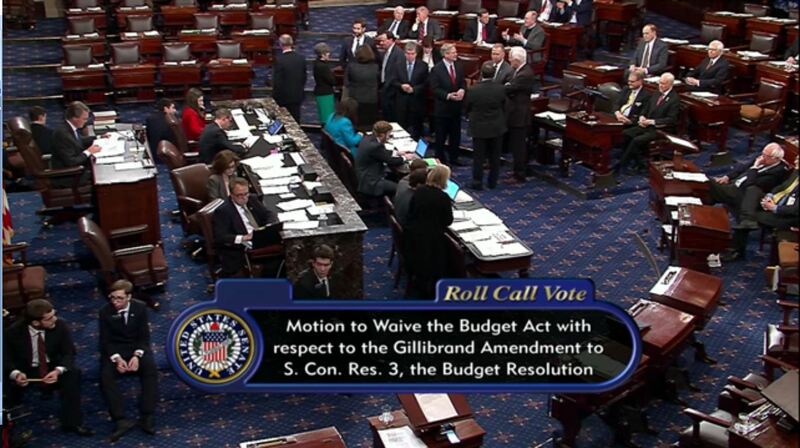 The procedural rules of the budget resolution killed every amendment that came to the floor during the lengthy vote, known in Capitol Hill parlance as a “vote-a-rama,” with a senator from one party objecting to each opposition bill that violated some procedural rule. Sen. Bernie Sanders, I-Vt., served as the Democrats’ primary attack dog, railing throughout the night against drug companies and Republican efforts to repeal Obamacare without a replacement. Sanders said repeatedly that 30 million people would lose access to health care if Republicans succeeded, and often looked perturbed as he finished speaking about an already doomed amendment. “How many of those 30 million people are going to die?” Sanders asked on the floor. While most of the amendments were symbolic in nature, one from Republicans could have had a significant impact on the resolution, had it been put to a vote. Sen. Bob Corker, R-Tenn., withdrew his amendment that would have pushed back by more than a month the date by which committees need to have an Obamacare repeal package in place. Some moderate Republicans have grown wary of repealing Obamacare without a replacement, though the concern does not appear to be enough to crack the party’s ability to repeal it. Obamacare has taken up nearly every moment of the Senate’s time since it returned from break last week. Last week President Barack Obama and Vice President-elect Mike Pence came to Capitol Hill to meet separately with members of their parties to discuss the future of the nation’s health care systems. The House of Representatives is expected to take up the Senate’s resolution on Friday.